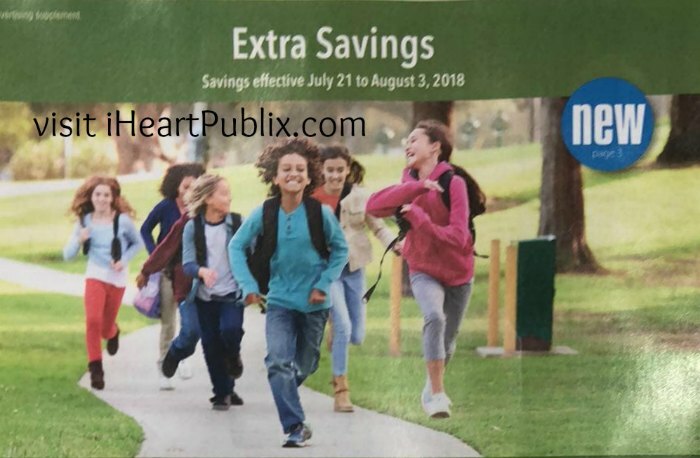 Here are the best deals I see in the Publix Grocery Advantage Flyer “Extra Savings” that runs through Friday, July 21st. Remember that these are just the Super Deals…you can still see the Full ad and matchups HERE. As low as 79¢ with coupon. –$0.50/2 Sparkling Ice (Checkout 51 Deposit) [Any variety. Items must appear on the same receipt; Cannot use this offer with any other print or in-app coupon or rebate.] As low as 75¢ each after cash back. As low as FREE with coupons and cash back. As low as FREE with coupons. As low as $1.08 each with coupon. As low as $1.99 with coupon. As low as $3.99 with coupon. As low as 40¢ each with coupons. $2 each with coupon and sale. –$1/1 Newman’s Own Salad Dressing (Ibotta Deposit) [Any variety; Any size] $1 with coupon and Ibotta. –$0.55/1 Kikkoman Product printable [10-oz.+] –$1/2 Select Kikkoman Sauces (Checkout 51 Deposit) [Valid on 10 oz or larger. Excludes Kikkoman Teriyaki Takumi, Stir-fry sauces and Orange sauces. Items must appear on the same receipt; Cannot use this offer with any other coupon.] -$0.55/1 Kikkoman Product, 06/24 SS (exp 8/31) [10-oz.+; DND] $1.45 with coupon. –$1/1 Mario Brand Product printable [Excludes snacking olives] $2.50 with coupon. –$1/1 Kraft Mac & Cheese Frozen Meal (Checkout 51 Deposit) [Any variety; Cannot use this offer with any other print or in-app coupon or rebate.] $1.50 after cash back. -$1/2 Swedish Fish or Sour Patch Kids Bags, 06/10 SS (exp 7/21) [6.5-oz. to 14-oz.] $1 each with coupon. Newman’s Own Dressing should say $2 with Ibotta, it says $3 and it’s $3 without the Ibotta. I like it. It let’s everybody get the deal. It’s a shame they let you misuse a coupon. That’s a crime. I do not find the BOGO PAce or Prego on DQ.